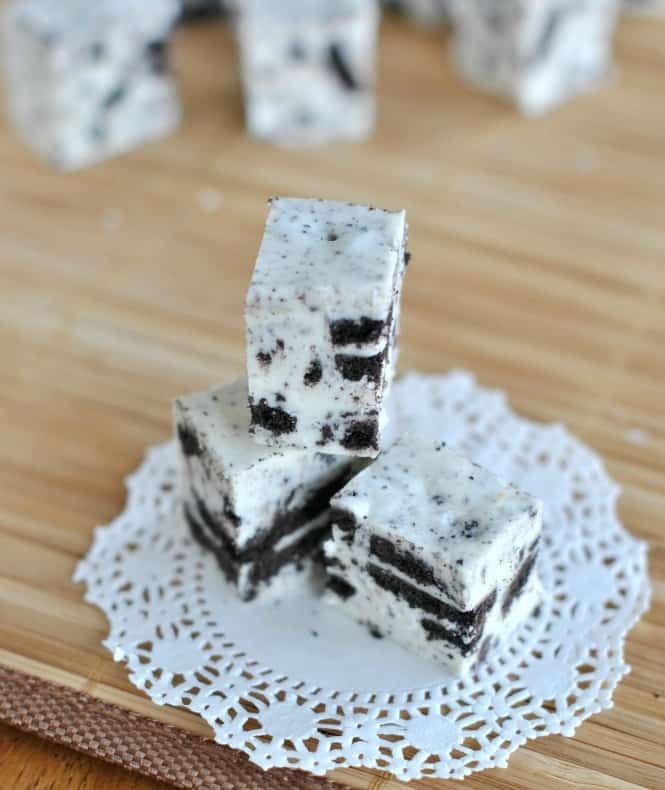 Easy, decadent Cookies and Cream Fudge recipe! 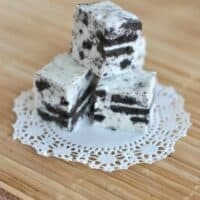 This Oreo Fudge is packed with flavor and perfect all year long! When it comes to candy making, I’d like to consider myself an expert. Oh wait, maybe that’s candy EATING. Although I’m still pretty great at knowing how to make vanilla fudge. One thing I love about today’s Cookies and Cream Fudge recipe is that you won’t need a candy thermometer. 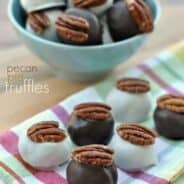 There is a time and place for candy thermometers….for example when making these Pecan Pralines or this English Toffee. But fudge? Most fudge can be made by just following these simple steps and tips. First, crush your Oreo Cookies. I do this in a ziploc bag and whack them a few times with a rolling pin. You don’t want crumbs, just small broken pieces of cookies. Set aside. Next, get your ingredients prepped in your mixing bowl. This way you’re ready to pour in the boiling liquid. Add your white chocolate morsels and marshmallow cream! In a large saucepan, melt butter with sugar, heavy cream, and salt. Cook and stir constantly over medium high heat until boiling. Once boiling, continue for 5 minutes (this is a good rolling boil). Remove from heat and pour immediately over ingredients in mixing bowl. Turn on low and blend for about 1-2 minutes, until white chocolate is melted and smooth. Fold in crushed Oreo cookies. Pour your fudge into a 9-inch square baking dish that’s lined with parchment paper. Allow to set (either at room temperature or in the fridge). Cut into squares and enjoy! When you’re looking for an easy dessert, this No Bake Oreo Cheesecake recipe is a creamy, flavorful pie! 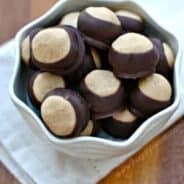 Easy to throw together for a delicious treat! Easy, fried donuts in under 30 minutes! This easy Cookies ‘n Cream Donuts recipe is made using Pillsbury Grands biscuits, Hershey Cookies ‘n cream bars, Oreos and Chocolate frosting. Perfect, right?! Easy Mint Chocolate Oreo Fudge recipe is the perfect addition to your dessert menu! Perfect for holiday, birthdays, or weeknight celebrations, you’ll love this delicious fudge treat! Oreo Toffee is a sweet and scrumptious snack! This is one party dessert everyone will devour! Sweet, buttery cracker toffee topped with a delicious cookies and cream topping! In a mixing bowl (with a stand mixer preferred), add white chocolate morsels and marshmallow crème. Set aside. In a large saucepan melt butter with sugar, heavy cream and salt. Cook and stir over medium high heat until mixture begins to boil. Continue stirring and boil for 5 full minutes. Remove from heat. 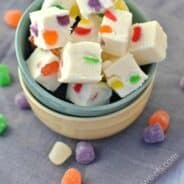 Pour mixture into bowl over the white chocolate and marshmallow. Beat with whisk for 1-2 minutes until white chocolate has melted and mixture is smooth. Fold in crushed oreos. Pour fudge into a 9-inch square baking dish lined with parchment paper. Refrigerate 4 hours or overnight. Remove from baking dish with parchment paper. Trim off edges (if you want perfect squares) then cut fudge into 1inch bite sized pieces. 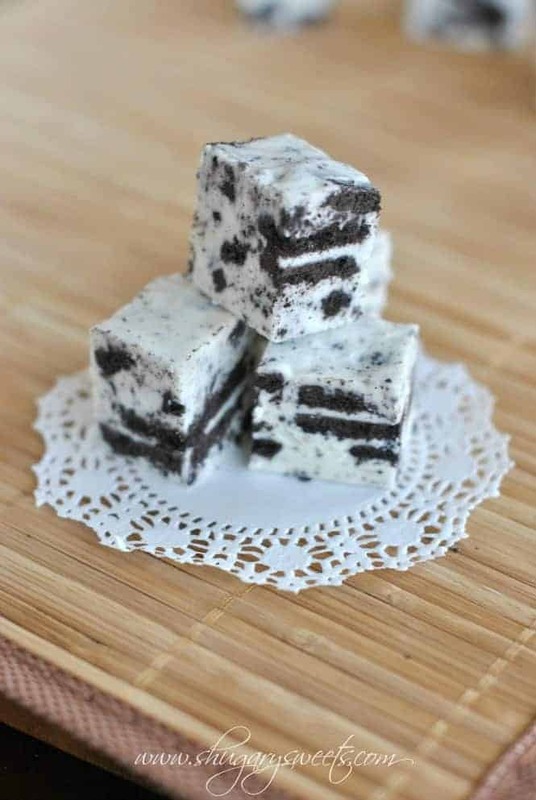 Today’s recipe for Cookies and Cream Fudge was originally published on Shugary Sweets on April 6, 2013 and has been republished in July 2018. Um this is one of the best fudge recipes every! I would say yes, I agree…but there are two more coming that are equally delicious. I can’t wait to share them! My boyfriend LOVES cookies and cream fudge. I feel like I could bargain for many, many presents in exchange for making it for him homemade 🙂 Thanks for the recipe! Congrats on the Food Fanatic Gig, your fudge looks amazing! Congrats, Aimee! That gig is perfect for you, an that fudge looks perfect for me. I love Oreos! Concerning the Cookies & Cream Fudge . . . Is it possible to use regular marshmallows (melted) instead of the 7 oz Marshmallow fluff? If you can, how many marshmallows do you need? (I think a full package contains approximately 40.) Your help is appreciated. Thanks. I’ve never used marshmallows in it’s place, so I don’t know if the consistency will work perfectly. However, if I were to do it, I would probably use about 20 full size marshmallows. If you try it let me know how it turns out! These look sooo delicious, I love cookies & cream anything! Yeah, we are oreo freaks around here 🙂 thanks for the congrats! Congrats on the new gig! So excited for you! And the fudge looks phenomenal, as always. Holy Mother! 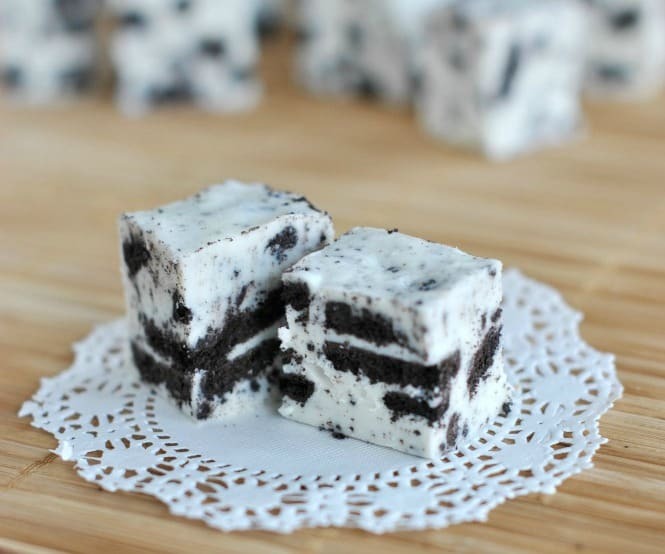 Cookies and cream fudge … you are brilliant!!!! Oh I love fudge! Definitely any time of year. This cookies and cream fudge yells to come into the sweet comfort place which is my belly. Oh my, this looks so good, thank you for posting this up, going to be giving this a go. Yum! Love that this doesn’t use a candy thermometer! I am a fellow candy eating expert, but not necessarily candy making, so I’m excited to try this one! Made this for my coworkers and they loved it! ‘We don’t deserve you!’ was the response lol great and super easy recipe. Thank you, Aimee for the recipe. I made it this morning for a gathering my friend is having tomorrow and it is delicious 😋. I can’t wait for my friends to try them.